Labor Day weekend is traditionally considered the end of summer since it is time to go back to school, days are getting shorter and tans are beginning to fade. It also marks the beginning of a season full of public programming for the Section of Archaeology at the State Museum of Pennsylvania. Our kick-off event is Harrisburg City’s Kipona Festival on City Island celebrating the Susquehanna River. Our booth will be located on City Island, west of the baseball field. Look for the tall ARCHAEOLOGY banner with The State Museum of Pennsylvania and Pennsylvania Historical and Museum Commission logos. Always popular is the replica 20 foot dugout canoe. Stop by, have a seat in the canoe and learn about the prehistory of the Harrisburg area. Artifacts recovered from excavations on City Island in the 1990’s will be on display along with a few of the stone tools used to make the dugout. Staff and volunteers from the Section will be present during the event to answer questions and offer insight into how people lived thousands of year ago. Brochures and other literature highlighting Pennsylvania archaeology will also be available. Every fall since 2006 the Archaeology Section of The State Museum of Pennsylvania has led a month-long excavation at Fort Hunter Mansion and Park in Harrisburg, PA. On September 7th, the search for the French and Indian War-period fort will resume. Prior excavations have documented thousands of years of human occupation at this spot overlooking the Susquehanna River that has served as a Native American campsite, a Colonial grist mill and trade location, a fort, and a Victorian-era farm. While previous years have been unsuccessful in locating the stockade or other fort structures, a new year brings new opportunities and expectations that this year’s excavations will prove successful. One of the goals this year is to further investigate a circular stone foundation that appears to represent an octagon-shaped smoke house built by property owner Archibald McAllister in the early 1800s. Rather than building the fire inside the structure (a fire hazard), a stove was housed in a small attachment to the octagon. Investigations in this feature will hopefully confirm documentary research and add to our understanding of this early entrepreneur of Harrisburg efforts to build a successful business in the early nineteenth century. A second goal is to investigate the area immediately off the side porch of the original 1786 stone house. Folklore surrounding the location of the Fort Hunter blockhouse is that it now lies under this structure. Artifacts associated with Native Americans and military objects were found last year, so excavations will continue in this location in hopes of finding fort-related remains. Come out and see what we find! Archaeologists will be on hand Monday-Friday, 9am-4pm to answer questions about the site and the archaeological process. In addition to weekdays, excavation will take place on Fort Hunter Day, to be held Sunday, September 18, 2016. Excavations will close for the year on October 7, 2016. What is the meaning behind petroglyphs, effigy mounds, beadwork, and images on pottery and smoking pipes? This year a series of presentations will focus on Indian symbolism in artifacts and on the cultural landscape. 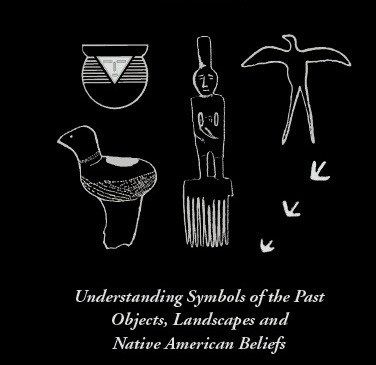 Anthropologists have long examined symbols created by past cultures as a way of interpreting and understanding social, political or individual expression. These take the form of abstract designs and depictions of animal, human and supernatural figures, frequently in stone and clay. The arrangement of earthworks and mounds also had meaning to people in the past. Some of these symbols had religious connotations. Others represented clans or depicted supernatural beings that required appeasement. Although rarely found at archaeological sites, symbols on baskets or beadwork on clothing are also expressions of religious and cultural beliefs. They are reflections of how people perceived and organized their world. Symbolic artifacts recovered from the archaeological record provide a unique resource for examining past cultural behavior. The presenters will examine the archaeological evidence of symbolism in Native American cultures and offer insights into their interpretations. In addition to the presentations, attendees can share their archaeological discoveries with staff from the State Historic Preservation Office who will provide assistance with identifying artifacts and recording archaeological sites, essential tasks for protecting and preserving our archaeological heritage. An additional offering includes a demonstration by a master flintknapper who will make stone tools using Native American techniques. A reception at the close of the sessions will provide an opportunity for the attendees to meet with the presenters and staff in the Anthropology and Archaeology Gallery of The State Museum. The program and registration form will soon be available from our website. If registered before October 21, the cost is $25 for the general public or $15 for students and $15 for members of the Heritage Society, SPA, or PAC. The cost of registration at the door is $35. Finally, October is Archaeology Month in Pennsylvania. 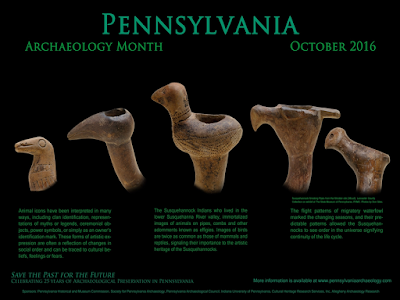 The Society for Pennsylvania Archaeology will have programming throughout the Commonwealth that is open to the public as well as these opportunities offered through the State Museum. We hope to see you at one of our many upcoming events! In recent weeks, our TWIPA blog has discussed a number of collections that have been donated to The State Museum of Pennsylvania. Have you ever wondered what happens to these collections once they are cataloged and accessioned into the museum’s inventory? Do they just disappear onto dusty shelves where they never see the light of day again? Does the final scene of Raiders of the Lost Ark come to mind? Although it isn’t possible or necessarily useful to put all of these collections on permanent display in the museum (there are literally millions of artifacts in the Archaeology Section alone), they do serve a purpose. Archaeological collections are comprised of a variety of artifacts that range from broken fragments of prehistoric or historic pottery to chipping debris left by native peoples in stone tool production. Each of these fragments is cataloged and while they hold important research value to archaeologists, they are of minimal use in exhibits. Some collections are put on temporary display, such as portions of the Doris Freyermuth collection that are currently part of the changing exhibit located on the second floor of the museum that features amateur collectors. Other artifacts are placed on short or long-term loan to institutions or historic sites. Some artifacts that have no provenience location (no specific collection site) recorded are sometimes utilized in the teaching collections for school children to see and handle. One of the most important uses of the State Museum collections is in scientific or scholarly research. A main objective of the collections policy is to acquire those collections that have research value. Many of these researchers are college students examining collections as part of completing a masters or doctoral thesis. For example, one of our recent visitors, Dan, spent several days conducting research for his doctoral dissertation. With the assistance of the Section of Archaeology curators, Dan’s forensic analysis of physical remains will be utilized to determine Late Woodland population migration patterns of the Mid-Atlantic Region. 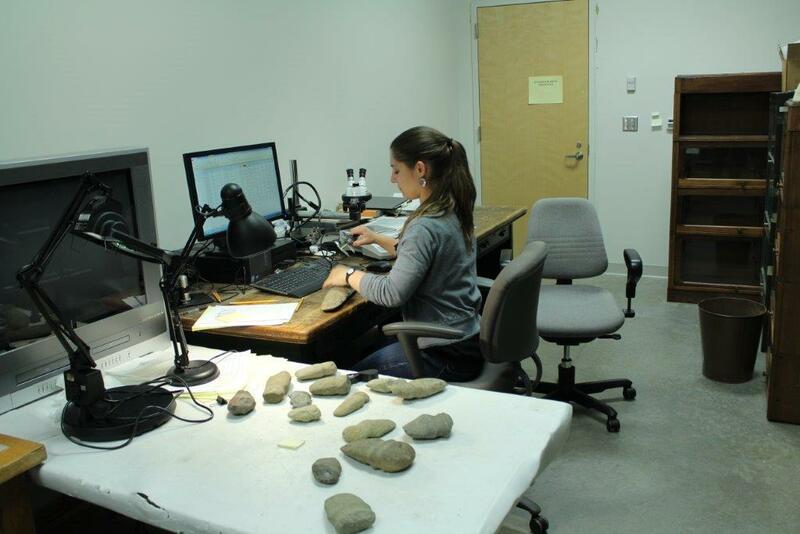 Another student, Lucy, spent nearly two months analyzing, measuring, and photographing bifacial and unifacial stone tools from fourteen different prehistoric collections for her master’s thesis at Mercyhurst University. Lucy utilized the State Museum’s extensive collection of artifacts from stratified sites that span the Paleoindian (11700-19800 BP.) through Middle Archaic (6850-10200 BP.) periods. The data she collected will be used to compare to other previous research that will hopefully support her thesis statement. Another type of researcher may be searching for specific artifacts that fit a pattern. 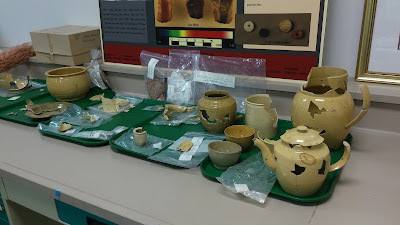 The Archaeology Section’s staff members Janet Johnson and Kimberly Sebestyen are currently conducting research on a specific type of pottery manufactured in Philadelphia in the early nineteenth century. Janet and Kim are identifying specimens of this pottery, analyzing them, and recording the information for each vessel. The data that is collected will be turned into an article for the Journal of the Council for Northeast Historical Archaeology that will, in turn, help to provide guidance for others seeking to classify this type of pottery in the future. Some research projects are conducted by students who occasionally spend a semester internship in the Section of Archaeology. These projects are designed to not only provide a learning experience for the intern but to serve a secondary purpose of completing important curatorial work within the section. The results of these projects may be used in many ways including to help better define the collections as a whole. 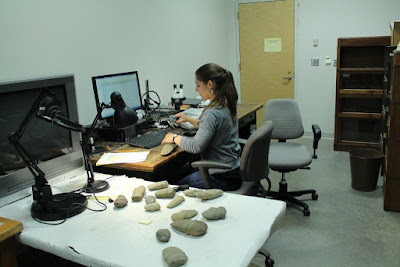 For example, two student interns conducted months of analysis on a group of stone axes, which allowed the specimens to be categorized in a manner that will assist future researchers who need to access this important resource. So, who is allowed to make use of the collections? Anyone with a legitimate research project may request access to the collections. Topics are as broad as the whole of human existence in Pennsylvania, as the museum’s holdings represent approximately 16,000 years of habitation from the PaleoIndian period through the twentieth century. If you are interested in conducting research in the Archaeology Section collections, please contact Janet Johnson at 717-705-0869 or janjohnson@pa.gov, or Kurt Carr at 717-783-9926 or kcarr@pa.gov for more information or to request access to a collection. We hope you’ve enjoyed this “behind the scenes” tour of our curation facility and the important resource we care for on a daily basis. Our preservation efforts along with the research conducted here have enabled archaeologists to further our understanding of the past. Please help us to preserve our archaeological heritage by collecting responsibly and organizing/cataloging your discoveries. We ask you to join us in ensuring that our archaeological heritage is preserved by supporting public programs and preservation laws so that we can protect the past for future generations.